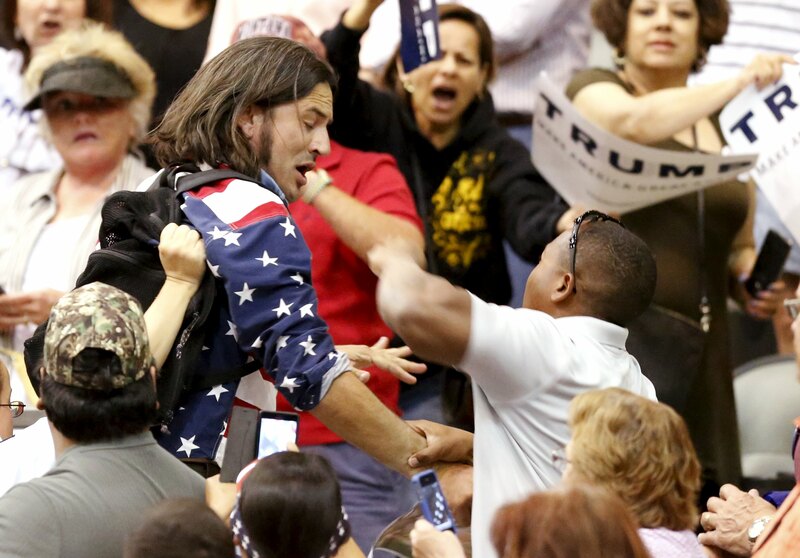 PHOENIX - A Donald Trump campaign supporter seen on video sucker-punching and then stomping on a prone protester at a rally in Tucson has been charged with misdemeanor assault. Pettway's attack was captured on multiple videos, showing him ripping the sign out of the hand of a protester being escorted away from him and then punching the man. After the victim is on the ground, Pettway then repeatedly kicks him. CBS affiliate KOLD in Tucson reports the victim's name is Bryan Sanders. "I was being escorted out of the building, I had that in my right hand a peace sign up," Sanders said. "A guy grabbed the sign out of my right hand and sucker punched me. Then he go to top of me and hit me several more times." The incident was similar to an earlier Trump rally assault in Fayetville, North Carolina, when Trump supporter John Franklin McGraw, 78, sucker-punched a protester being escorted out. McGraw has been charged with assault and disorderly conduct. After the rally, the syndicated TV program "Inside Edition" reports McGraw said, "He deserved it. The next time we see him, we might have to kill him." Trump has been dismissive of the many who criticize him for inciting violence against protesters at his rallies. He has instead blamed the violence on "thugs" and "professional protesters." He also blamed Democratic presidential candidate Bernie Sanders and threatened to set his supporters on the Vermont senator's rallies.